About Jains for folks who know absolutely nothing about them. Martin Luther King changed our country with his courageous and unrelenting stance based rock-solid on non-violence. He learned it from Mahatma Gandhi. So our country has benefited enormously from the Jains’ profound belief in ahimsa. I’ve had Jain friends for more than 30 years. Many Jains came to America as part of the huge “brain drain” raging in India at that time. Doctors and engineers. I was lucky to meet them. As I said, bear with me. I started this long drive home across America more than two weeks later than planned. I was in Newport Beach with milady Annabelle, just south of Los Angeles. I got the late start because I was invited to attend a symposium. Jainism was going to be a big part of it. To be held at the Claremont-Lincoln University and Claremont School of Theology in Claremont, California. It’s just a few miles northeast of L.A. I couldn’t want to say no. And I didn’t want to say no. I was much interested. It would be just a 50 or 60-mile drive for me. And on my long way home to Connecticut. Now, for you to understand, I have to go way back. I was living in a suburb of Worcester, Mass. I had started and was running a nice PR office. Had a small staff. I worked mostly for hospitals, with a variety of other clients as well. Was enjoying it all. I looked at this one and that one and that once. Rejected them all. Then I came upon one I liked. It was owned by an Indian named Sulekh Jain. A Ph.D. engineer with metallurgy his specialty. Maybe he had read the same book. I never found out. We negotiated. Agreed on a deal. I gave him a deposit. He had to do something he wasn’t familiar with: give me a certificate there was no lead paint in the building. Lead paint can be deadly. It was a new law in Massachusetts. He called in an inspector who found lead paint. It killed the deal. Dr. Jain returned my deposit. I continued my search. I found another instead. Some months went by. I used to enjoy swimming laps at the Y after my day’s work. One day after a swim I went right across the street to the Worcester Public Library. In one room I spotted Dr. Jain reading. Should I go over and say Hi? I decided yes and approached him. And I said, “If you can walk, you can swim.” Just a short, friendly exchange. I went on a way. Oh, that lead paint test had been false. He had gone on and sold his building. What to do? I said yes. I gave him a lesson. And another. And another. He swam the pool. And we became friends. We learned a lot from one another. I was horrified. He said, “We believe young people are too young for such an important decision. No worldly experience. And their passions are raging. It’s right for our parents to decide for us. It is their great responsibility to us. They have to arrange the best match possible. That is not true of all Jains, however. Many Jains have family names other than Jain. the country. We attended the wedding of his son, Anudeep. It lasted three days. He and Ravi attended the wedding of one of my kids. We visited one another. At that time there were about 40,000 Jains in the U.S. and Canada. They clustered in big cities. They formed a big association, JAINA —the Federation of Jain Associations in North America. He took a big interest, on the side. Was elected national secretary. In time, national president. My daughter Monique convinced me. She was working for me. Later she went on to law school. A talented gal, my daughter. Sulekh, my friend for 30 years.We have had many adventures together. I went. Flew over by myself. They were flying from a different part of the U.S. I met Ravi and Sulekh at the airport in Delhi. A huge delegation was there to greet him. Like a cardinal arriving. Or an ambassador. It was a caravan of cars to a wealthy Jain home. There a servant gave me a roll of toilet paper. Bought just for me. Indians don’t use it. I was in an upstairs room. In the middle of the night, a terrible banging and clatter downstairs. I went down. The others were all there. Monkeys had gotten in through an open window. Were tossing pots and pans around. What an education I got. We toured India for seven weeks. A chauffeur drove us around. At times, we took short flights. We stayed mostly with well-o-do Jains. But sometimes at an ashram—a religious retreat. In the evening Sulekh would speak to a group arranged just for him. In Hindi. just a word of English now and then, so I could follow his presentation. At one point he would introduce me and I would say a few words. Everybody was very nice. They were vegetarians—no violence to animals!—and I had to be vegetarian. Every night they made sure I was totally wrapped in mosquito netting. Mosquitoes give malaria! 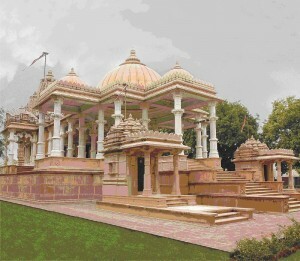 Jain temples are breathtakingly beautiful. places. Especially thousand-year-old Jain temples. Beautiful beyond words. I was in a meeting with the publisher with The Times of India. Its most important paper. And had lunch with the Chief Justice of the Supreme Court of India. Not because of me. Because I was with Sulekh. Our tour…my meeting so many Jains…was a life-changing experience for me. When I came home, I wrote about that, of course. And I have written about Jainism a number of times. Some of my articles have been published in national Jain newspapers here. All these many years, my friend Sulekh has continued this work in strengthening JAINA for all Jains in America and in making Jainism better known far and wide. He continues as one of the known national leaders of JAINA to this day. It is his passion. No other way to describe it. Someday JAINA will have a statue memorializing Dr. Sulekh Jain, I am sure of that. Our friendship has gone on and on. I was the emcee at his 70th birthday party, one of the few white people there. When I returned from Peace Corps, he had me talk at a Jain temple in Houston where they live. (I should tell you that I went to India again on my own. Alone. It was an important part of my trip around the world. I traveled all the way across India from Calcutta—now called Kolkata—to Bombay—now called Mumbai. I also went to famous sites. I also looked up other Jains, one in particular, my good friend RP Jain. A fabulous trip. Sulekh has been doing big things. Here is one. Several years ago he began sending Ph.D.s in religion and philosophy—some doctoral candidates also—to India for an intensive program in Jainism. They lived with Jain families. Attended lectures on Jainism by top experts. Toured fabulous Jain spiritual and cultural centers—many are ancient, astonishingly beautiful, and world famous. Lived the Jain life. And went sight-seeing to the capital These scholars paid just a small percentage of the whole bill. Jains picked up the big part of the bill–wealthy Jains in India and here. Year by year, the program has gotten bigger, with more Americans flying over. And back home, these scholars are often teaching courses on Jainism and writing about it. A few years ago, a remarkable American, David Lincoln along with his wife made a $ 10- million gift to Claremont School of Theology. He has followed up with $40 million. $50 million in all. This money for Claremont, which has Methodist roots, was earmarked to launch something dramatically new—a school that will do research on and teach courses on many religions. Not only Christianity and Judaism, but many important, if not well known, religions around the world. Jainism being one major one. You can imagine what a diverse and broad faculty has been developed. The school is now Claremont-Lincoln University and it is making history in the special world of theological schools. So I went to the symposium at Claremont-Lincoln University with excitement. It is temporarily housed at the Claremont School of Theology,. The symposium had three parts. The first was a panel with top experts speaking on four Asian isms—Hinduism, Buddhism, Sikhism, and Jainism. I’ll merely mention the panelists. You will thus see their deep backgrounds and points of view. –Rita D. Sharma, professor of Hindu studies at the University of Southern California and prolific scholar. –Donald K. Swearer on Buddhism. 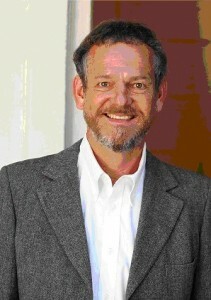 He is emeritus professor of world religions, with many years at Harvard Divinity School and Swarthmore College. –Niranjan Singh Khalsa on Sikhism. He is the director of the Sikh Council in California and a leader in the Sikh community for 30 years. –Jeffery D. Long on Jainism. He is professor of religion and Asian studies at Elizabethtown College in Pennsylvania.. He is the author of the book, “Jainism: an Introduction.” He was one of the early scholars who went to India on the JAIN -sponsored summer program. Each panelist spoke for a set time, then answered questions for a set time. The result was interesting and instructive, even to a neophyte like me. The emcee was remarkable. He was fair, friendly, and effective. He kept it moving and lively. 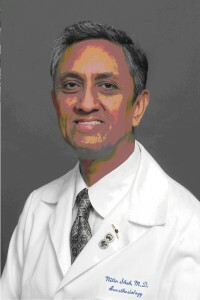 He was Dr. Nitin Shah, about 50, poised and vigorous. I thought he was another academic and I mentioned this to him later. Dr. Shah, the emcee, was an academic but of a different kind! He chuckled. He said, “Yes, I am. I am professor of anesthesiology at Loma Linda University School of Medicine!” He chuckled again. Not the kind of academic I had in mind. He is a practicing M.D. and anesthesiology is his specialty. He is a Jain. Later Sulekh told me that every year Dr. Shah leads free charitable medical camps of volunteer doctors to India and Africa to treat natives who otherwise would not get such expert medical care. Then came dinner. I knew it would be vegetarian. And also 5-star excellent. But I was wrong. It was not only vegetarian. It was vegan. Vegan, as you may know, is total vegetarianism, meaning no animal products of any kind, including eggs and dairy products (which ordinary vegetarians like me eat. My idea of vegetarian is: I don’t eat animals. I do eat eggs and dairy products–you don’t have to kill the animals in order to eat these). I was amazed by how many offerings were available. From soup to nuts, so to speak, not overlooking desserts. A variety of soy products substituted for milk products, for instance. Amazing. And how delicious it all was. And how totally satisfying. There was a lot of good fellowship and good talk and high spirits. But no alcoholic beverages of any kind. That was not news to me. I’ve heard Sulekh expound often how Jainism offers principles of universal application and importance. And I appreciate that. It was deep, deep, deep. I could see scholars around me focusing on every word and thought. But I had difficulty. I was in deep water although I’m a fair swimmer. But I hung on. Dr. Clayton of Claremont-Lincoln did something I’ll remember. man with top credentials, including a stretch at Harvard Divinity School. Here is what wowed me. During Dr. Long’s address, I saw Dr. Clayton scribbling, scribbling, scribbling on a yellow pad. At the end of Dr. Long’s address, Dr. Clayton rose and read what he had composed on that pad. Beautifully and dramatically composed. It was a 500 word—maybe it was 1,000 words—of synthesis and appreciation of Dr. Long’s address. I was spellbound. It was of publishable quality, without changing a comma. A feat I will long remember. Then came a wonderful social hour, with much circling and mingling. I met many interesting new people. One I enjoyed particularly was Dr. Subhash C. Jain. He came in smart, classic gentleman’s Jain attire —I wish I had a picture to show you. 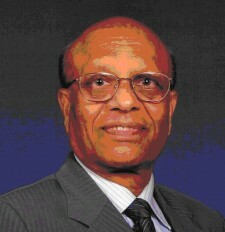 He is professor emeritus of civil and environmental engineering at the University of Iowa. There 40 years! A smile again. “And I was happy with all the decisions my parents made for me.” My friend Sulekh feels the same way, of course. Slowly the group broke up. Some had flown in from long distances. Sulekh, for instance, was going to take a 7 a.m. flight back to the Houston area. Many Indians live there because it approximates the year-round climate of Delhi. Sulekh and I hugged one another and said goodbye. He always calls me Bhai John. For 30 years now. It means Brother John. I was one of the last to leave. It was dark out. I wasn’t sure which of several parking lots I had parked in. Not funny. A young woman came along in the dark. I latched on to her. Her name was Beverly (if I remember correctly). She also had gone to India for a summer on the Jain Program. She went way out of her way for me. I liked her so much I was tempted to give her a hug before she disappeared in the dark. I want to be clear about one thing. It is easy to jump to conclusions. I don’t want you to do that. I am not a Jain. But I greatly admire Jains and some of their beliefs. For the record, over the years I have sampled the religious services of maybe a dozen faiths, from Unitarianism and other isms to Mennonitism. And some outside Christianity, such as Judaism and Bahai. I have also been to Muslim temples. And I’ve looked into two very different isms—agnosticism and atheism. All in a spirit of curiosity and desire to understand. Jains, by the way, do not believe in a Creator God. Sulekh has told me that they use the very same word for Nature and God. I’m no expert but I believe that the great majority of religions all offer something valuable and good. What we have to keep distinct are core beliefs and superstition. Lots of superstition in the world. Of course, it’s always the other religions that are rife with superstition. Like people’s accents. We never have an accident. It’s always those other people. So, I was glad to delay my start on my long and slow ride across America for this remarkable symposium. That was my first night of many on the road. I had much to think about as I snuggled in my bunk in my van. It took me a while to doze off. creative people, like yourself. believe in ahimsa but not in all cases. would not have worked against hitler. Or was Hitler’s vegetarianism, soberness (no alcohol) and no-smoking just propaganda as well? As always, a great story! As I said, repeatedly, you meet such wonderfully interesting people. Not only do you meet them on a short-term acquaintance; but you keep up a friendship with them. And, you are the better for it with the experiences that you share with them. I had to consider about how I think about this religion. I admire the fact that they don’t want to harm anyone; but I don’t think I could ever live that way. I do eat meat, and don’t intend to change that. I do take part in the killing bugs and mice. After that, I do believe in humane treatment of animals and people. Unfortunately, we live in a world that practice the opposite of their beliefs. How does one survive in a world of violence and terrorism? Complete pacifism would be your downfall. I would not instigate anything; but I really don’t know what I might do if my family and loved ones were being attacked. This is quite a serious topic; and one that I have such mixed feeling for. Looks another trip to India for you in the wintertime….what a gadabout! No moss will ever grow under your feet! Hope your trip is going well and your camper is holding up.